"We must all be careful. This is a great change. We'll be exposed to peculiar influences." Ismail Merchant and James Ivory began making films together in the early 1960s, but it wouldn't be until the end of the 1970s before they would tackle the first of the many literary based works that have defined their career. 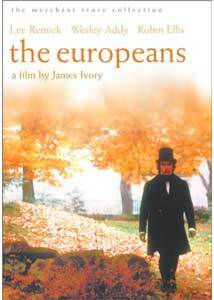 Their debut would be The Europeans, an adaptation of American author Henry James' 1878 novel, introduced to Ivory by screenwriter Ruth Prawar Jhabvala. The idea for the film was first pitched for public television, but was not well received, with funding for the production eventually found overseas. Shot on a modest $700,000 budget, The Europeans was one of the first Merchant Ivory productions to appeal to a wide audience, and foreshadows the many great works to come in its style and production. Felix: No. Though I could easily be French if you'd like. Gertrude Wentworth is enjoying the pastoral quiet of a Sunday afternoon in rural Boston after rebuffing her would-be suitor, the Unitarian minister, Mr. Brand, when from out of nowhere appears Felix Young, announcing himself her European cousin. He has come with his sister, Eugenia, a baroness in the midst of having her marriage annulled, who ingratiates herself and her brother on the Wentworth household, and at the suggestion of Robert Acton, is put up in the Wentworth's second house. For Gertrude's father, there is cause for concern in their arrival, as his family's is a very simple lifestyle, unaccustomed to the influence of the outside world, but Gertrude is filled with an excitement for things new, and especially the young and adventurous Felix. Mr. Acton is in his own way attracted to Eugenia, and is eager to know her intentions, and she urges him on, to the disdain of Robert's sister, Lizzie. Mr. Brand is none too enthusiastic about Gertrude's new interest, but when Felix begins to meddle in the affairs of the Wentworth family, they take on their own life in unexpected fashion. Eugenia: You Americans are very strange. You never ask anything outright. Robert Acton: We Americans are very polite. We don't like to tread upon people's toes. After being spoiled by period masterpieces such as A Room With a View, Howard's End and The Remains of the Day, it is hard not to have high expectations when going into a Merchant Ivory film. Upon first viewing, The Europeans seems a bit of a disappointment, the characters not quite grabbing my attention or sympathy; upon revisiting it, the simple charm and underplayed characters began to find their mark. Visually, it fits right in with the producer's other period pieces�the cinematography is gorgeous, basking in yellow and orange autumnal hues, and the attention to period detail that has become the Merchant Ivory trademark is on full display. The story unfolds at a leisurely pace, building in complexity as Felix's plans begin to gel, and the cast deliver fine performances, filled with nuance. The film works well in almost every sense, but there is something I can't quite put my finger on that keeps it from greatness. However, The Europeans set the stage for the work to follow, and as such is a requisite entry in the Merchant Ivory Collection�and mine. Image Transfer Review: The Europeans is presented in a new 1.78:1 anamorphic transfer. Colors are deep and lush, but a little on the earthy side. The source print has its share of minor imperfections, and there is a bit of shimmer on fine lines and in backgrounds. Detail is excellent overall, and there is good depth to the picture, although a few scenes seem just a little on the dark side. There are no signs of compression artifacts or edge enhancement present. Audio Transfer Review: The mono audio track is well presented, with any irregularities seeming to originate in the source. Location dialogue is for the most part easy to discern, however it does become somewhat overly sibilant at times. The soundtrack is well balanced, though does evidence some background noise throughout. During the dinner party sequence, the orchestra becomes a bit edgy and distorted. These complaints are fairly minor, as they do not detract from the viewing experience greatly. Extras Review: Excerpts from a collection of interviews appearing across the Merchant Ivory Collection make up Conversations with the Filmmakers, where producer Ismail Merchant, director James Ivory, screenwriter Ruth Prawer Jhabvala and composer Richard Robbins discuss their involvement in The Europeans. This feature runs 15m:16s, and covers how the project came to be along with many of the challenges presented in adapting novels to the screen. Also included is the 1976 Merchant Ivory-produced short, Sweet Sounds, written and directed by Richard Robbins. Filmed at New York's Mannes College of Music where Ruth Jhabvala's youngest daughter was learning piano, the film is an interesting piece where aspiring young musicians learn their art, including performing for their classmates. Trailers for The Europeans, The Bostonians and Maurice are also to be found. As with the other films in the Merchany Ivory Collection, the packaging is extremely tasteful, but I do have an issue with expending half of the promotional blurb with a spoiler for the end of the film. The insert contains technical details along with two essays, the first on the the feature film, the second on the Sweet Sounds production. Fans of romantic period drama should be pleased with this early Merchant Ivory production. While it may not rise to the levels of greatness that some of their later work does, The Europeans is still a beautifully filmed, and finely acted film. Recommended.